Objectives Smoking cessation programmes in combination with financial incentives have shown to increase quit rates in smokers, but it is not clear which elements of this intervention help smokers to succeed in their quit attempt. The aim of this study was to explore the view of successful and unsuccessful quitters about which factors had affected their ability to quit smoking. Design Semistructured qualitative interviews were conducted and analysed using the Framework method. Setting Interviews were conducted in 2017 with employees from nine different Dutch companies. Participants 24 successful and unsuccessful quitters from the intervention group of a cluster randomised controlled trial (RCT) who participated in a workplace smoking cessation group training programme in which smoking abstinence was rewarded with financial incentives. Results Themes that emerged were the workplace setting, quitting with colleagues, motivation, family support, strategies and the financial incentives. The interviewees reported that the smoking cessation programme was appreciated in general, was convenient, lowered the threshold to sign up, stimulated peer support and competition and provided strategies to resist smoking. Personal motivation and a mind set to never smoke again were regarded as important factors for quit success. The financial incentives were not considered as a main motivator to quit smoking, which contradicts the results from the RCT. The financial incentives were considered as more attractive to smokers with a low income. Conclusions According to participants, contributors to quitting smoking were the workplace cessation programme, personal motivation and peer support, but not the incentives. More research is needed on the contradiction between the perceived effects of financial incentives on quit success and the actual difference in quit rates. The qualitative approach used in this study enabled identifying which specific factors in the context of a workplace smoking cessation group training programme with incentives facilitate quit success. 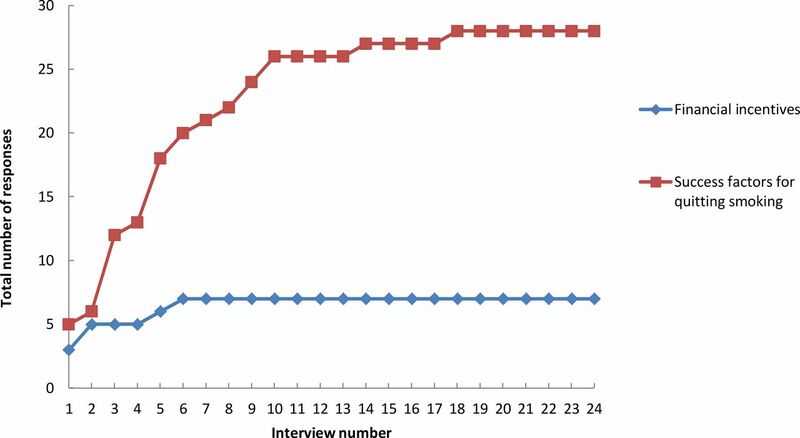 The study shows the perspective of the target group by interviewing employees who actually have participated in the smoking cessation programme. The success factors for quitting smoking mentioned by the participants can be used to improve existing smoking cessation interventions. The limited number of participants may represent a particular selection of the general population and results may not be generalisable. Incentives for quitting smoking may be a sensitive topic and could be prone to socially desirable answers. Workplace-situated smoking cessation group programmes have been shown to be effective.7 Led by a health professional, group programmes are designed to aid quitting by increasing motivation, improving knowledge and skills and providing social support.7 8 However, the role of social processes is usually not evaluated in trials.7 9 Coworker interaction may stimulate or hinder success, as may influence outside the work environment, for example, family or friends.3 Additionally, individual factors such as motivation to quit,10 perceived ability to quit, beliefs about smoking3 and an identity change towards being a ‘non-smoker’11 may play a role in achieving long-term abstinence. Smoking cessation interventions are sometimes combined with financial incentives to promote attendance or to enhance abstinence rates, which has been shown to be effective in various experimental trials.1 12 13 Regardless of their effect, smokers do not necessarily consider incentives a motivation to quit smoking.10 14 In a previous study,14 incentives were considered a reward or bonus for quitting and something ‘to work towards’. Some participants indicated that the reward was a ‘tipping point’ to quitting. It was suggested by service providers that the incentives could encourage participants to stick to their treatment, thereby increasing their chances to quit. Apart from the quantifiable effect of a smoking cessation intervention on quit rates, it is important to investigate how a smoking cessation programme with incentives at the workplace is experienced by the employees who participate in it, and which factors they consider to be key in succeeding at quitting. Little research has been done on how employees feel about their employer’s initiative to promote smoking cessation, there is a lack of knowledge on the effect of social interaction on smoking cessation in a workplace setting and it is unclear how exactly financial incentives may motivate smokers and lead to higher quit rates. Therefore, the aim of the current study was to investigate how employees who participated in a workplace group smoking cessation programme with financial incentives evaluated this intervention, to assess their perspectives on the incentives and to identify which success factors had affected their ability to stop smoking. The participants interviewed for the current study were part of an RCT investigating the effect of incentives on smoking abstinence.15 16 In the RCT, 604 employees followed a 7-week smoking cessation group training programme organised at their workplace by professional stop-smoking coaches experienced in giving smoking cessation group training in a workplace setting. Participants in the intervention group earned gift vouchers with a total value of €350 for carbon monoxide (CO)-validated continuous smoking abstinence. Participants earned the first voucher of €50 if they were abstinent based on self-report, validated by CO measurement directly after finishing the smoking cessation training. The next €50 vouchers were earned if participants were abstinent for 3 months and 6 months after the cessation training, and the final €200 voucher was received for smoking abstinence 12 months after finishing the training. The vouchers could be exchanged in a digital gift shop for a broad range of products and activities. The interviews and the qualitative analyses were performed before the results of abstinence rates from the trial were deblinded. Neither the participants nor the researchers were aware of the outcomes of the RCT during the interviews. Between June and November 2017, we invited 26 Dutch employees from nine companies who were participating in the RCT15 for an interview. Only participants from companies that were within 30 days of the 6-month follow-up moment and from companies that were randomly selected to receive vouchers for quit success were invited for the interviews. Participants were purposefully sampled to obtain an oversampling of successful quitters, in accordance with the aim of investigating the factors contributing to quit success. More participants with a lower income were invited, because the relatively high proportion of smokers in this socioeconomic group makes it an important target for smoking cessation interventions. Participants first received an email to inform them about the purpose of the interviews and were later called by telephone to ask whether they were interested in participating and to make arrangements. Two people refused to be interviewed with no specific reason. The interviewers and interviewees had not met before. A qualitative approach was chosen to investigate participants’ experiences and perspectives. Based on a pilot-tested interview guide (main questions shown in table 1), semistructured interviews were conducted with participants individually. Interviews were conducted by FAvdB and GEN. FAvdB was trained in interviewing by GEN, who is a trained and experienced interviewer. In order to match the interview style, for the first two interviews, both interviewers were present. Interviews were conducted in a quiet and private space at the workplace or at the participant’s home. Participants had been informed about the confidentiality of the interview and given their written informed consent to participate in the study. The interviews explored the participant’s experiences with the smoking cessation training programme and with their quit attempt. Because the influence of incentives on smoking cessation was of special interest to this research, participants were asked at the end of the interview what they thought about the incentives, and if the topic did not come up spontaneously, whether the incentives had influenced their enrolment in the programme or their quit success. Interviews lasted between 20 min and 40 min each. All interviews were conducted in Dutch and audio recorded. The audio recordings of the interviews were transcribed verbatim. Interviews were uploaded and analysed in NVivo V.11 according to the ‘Framework’ method.17 This is an analytic approach developed for conducting applied qualitative research and involves a number of stages through which data are analysed. The stages are familiarisation with the data, creating a thematic framework, indexing, charting, and mapping and interpretation. The data were analysed by two researchers (FAvdB and LMED). A mixed approach of coding was used based on predefined themes from the topic list, and ‘open’ coding, in which codes were ascribed to data based on their emergence on reading the transcript. Two researchers (FAvdB and LMED) each coded three assigned transcripts individually, after which the codes were discussed and a set of codes was agreed on. Thereafter, based on the set of codes, three more transcripts were analysed by the two researchers individually, and results were compared a second time. The code set was adapted after deliberation and used to index the remainder of the interviews. Any new codes that appeared were discussed between the researchers. Codes were combined and rearranged into themes and subthemes that arose from the data. Based on the topic list, the theme ‘financial incentives’ was divided into: influence of vouchers on enrolment, influence of vouchers on motivation to quit and appraisal of vouchers. Furthermore, the data were rearranged into success factors for quitting smoking. Additional themes that arose from the data were reasons to quit smoking and barriers to quitting smoking, but these themes are not described further in the current article; instead, we chose to focus on the themes that were considered most relevant, which were financial incentives and success factors. Comparing the responses of successful quitters with responses of unsuccessful quitters on these themes revealed no different patterns between these groups. Therefore, the results for the themes are presented for all respondents together. Framework matrices were constructed for the themes financial incentives and success factors for quitting smoking, in which the relevant data for each respondent were integrated. By reviewing the framework matrices and by checking the original transcripts, the data was synthesised and interpreted. Data saturation was reached for the theme incentives after six interviews and for the theme success factors after 18 interviews (figure 1). Total number of codes mentioned by the participants for the themes financial incentives and success factors for quitting smoking. Patients were not involved in the design of the study. The results of this study will be disseminated to (participating) companies and employees via a paper, a press release and media coverage. Table 2 presents summary characteristic of the interviewees. Seventeen men and seven women were interviewed, half of whom had a low income. Fifteen participants had been abstinent since the end of the smoking cessation training programme, that is, at least 6 months. Nine participants had initially quit smoking but relapsed somewhere within the first 6 months. The participants’ age was between 25 and 61 years old. The majority of participants had attempted to quit smoking in the past. In the interview, participants were asked what they thought about the vouchers, and whether the vouchers had influenced them to enrol in the smoking cessation training programme or to quit smoking. Before enrolling in the smoking cessation training programme, participants knew that there was a chance to be eligible to earn vouchers for quit success, but they did not know that they had been randomised into the incentives condition until the first session of the training programme. The majority of participants said that the gift vouchers had not had any effect on their motivation to enrol, while some thought it added somewhat to their own motivation. Almost all subjects stated that if they had not been able to earn the reward, they would also have applied for the training programme. ‘It was not the motive for me. Even if it had been without a reward, I would have done it’ (participant 9, successful quitter, moderate income). The few participants who did consider the gift voucher as a stimulator for enrolling in the training programme fell in the low-income category. ‘So, the intervention group. Sure, that was really something nice to experience. But I would absolutely have taken part anyway, even without it. But yeah — it was definitely an extra incentive’ (participant 2, smoker, low income). None of the participants spontaneously brought up the vouchers as a reason to quit smoking. When asked whether the vouchers were a motivation to quit smoking, most participants stated that they experienced the vouchers as an added bonus, but not as a reason for quitting. ‘For me, that wasn’t the motivation to do it. It was more like a nice bonus’ (participant 8, successful quitter, income unknown). Participants enjoyed receiving the voucher, and it felt good to have earned one, but they quit because they were intrinsically motivated and had more important reasons for quitting smoking than the vouchers, such as their or their children’s health. Some participants had the feeling that it would not be possible to quit smoking just to earn a voucher: inner motivation was considered crucial to succeed in quitting. ‘Being offered a gift certificate wasn’t a matter of, “Oh gee, I better quit because, you know, I can earn money if I do.” No, that’s pointless, because you won’t be successful that way. You definitely won’t go the distance like that’ (participant 5, successful quitter, low income). It was mentioned that the urge to smoke was stronger than even a much larger hypothetical reward. One subject thought that the voucher could subconsciously have contributed to quit success. ‘Subconsciously, it will indeed be a stimulus that makes you think: Oh, that’s a nice added benefit’ (participant 3, successful quitter, low income). Another participant thought that the voucher had been a motivator to stay abstinent from smoking. ‘Yes, it did factor in. I think that it did actually serve as a motivation to keep going’ (participant 2, smoker, low income). Participants were asked how they felt about the incentive. Most participants liked and appreciated the vouchers as a reward for success in quitting. ‘I like it; I’ve been using it to do fun things, too’ (participant 17, successful quitter, moderate income). A few subjects had not used the vouchers yet. Some participants had not paid much attention towards the gift. ‘Well, to be honest: I haven’t done anything with it yet. I haven’t given it a bit of thought, either’ (participant 12, smoker, high income). It is notable that the participants who had not yet spent the vouchers had a relatively high income. Although most participants considered the amount of the vouchers generous, some participants found that the vouchers were not large enough to motivate them because they saved a lot more money by not buying cigarettes anymore compared with the amount of the vouchers. ‘I mean, most people think the same way that I do: you earn more by quitting on your own than with that reward. If you smoke a pack a day at around €6.50, you have already earned more per week than the gift voucher is worth’ (participant 6, smoker, low income). The following paragraphs describe the factors that, according to the participants, had positively affected their ability to stop smoking. Participants found that the employer offered a smoking cessation training programme encouraging and saw it as an opportunity. Some participants mentioned that their employer’s involvement was an additional motivator to quit smoking. ‘It motivates as well if management asks: oh, did you manage to quit? You know, that’s also a motivation and nice to hear’ (participant 7, successful quitter, low income). Several participants mentioned that by offering the smoking cessation programme, employers showed their care for the employees’ health and well-being. The majority of participants found it easy and convenient that the training programme was situated at the workplace. Participants reported that the threshold to sign up was low because the workplace was a familiar and safe environment, because they did not have to travel to attend meetings and because it did not cost them extra time. ‘Somehow, you sign up sooner than if it were outside work’ (participant 15, smoker, high income). Four participants said that the location of the smoking cessation training programme was all the same to them and that they would have attended the training programme as well if it had been held at a different location. The majority of participants enjoyed the social aspect of quitting smoking in a group. They felt supported and encouraged by their fellow quitters and enjoyed sharing experiences during the training sessions. It felt motivating to quit with others and to have a mutual goal. ‘It’s good that such a group gives you confirmation that you’re on the right track, but also that you can reach out to each other. Yes, you’re going through the same things, basically’ (participant 11, successful quitter, moderate income). Many participants described a feeling of peer pressure and competition among colleagues, which motivated them to refrain from smoking. ‘Secretly, it’s a competition, of course; I mean, you’re looking around, going: “Right, who’s the weakling that’s going to cave in first.” Everyone placed their bet, obviously. It wasn’t me, thank goodness, but still. No one wants to be a loser, it seems to me’ (participant 10, smoker, high income). Attending the training programme with colleagues compared with strangers was an added value to some participants. ‘Yeah, you almost spend more time with them, on a daily basis, than with your own family. So, yeah, I guess what that means is, that when you quit at work, you see those people for a big part of every day and then there’s the check too and wanting to prove to them, “See, that’s right, I’m still off smoking.” That’s quite nice’ (participant 22, smoker, moderate income). Other participants stated that it did not matter to them who the other group members were. For some participants, an additional advantage of following the training programme with colleagues was that they could go to them during the workday for support when they were craving a cigarette. ‘Then at a certain point, you start to crave a cigarette again, so you walk over there (laughs) and you’re like: “How’re things going with you, then?”’ (participant 6, smoker, low income). Many participants mentioned they had succeeded in quitting smoking because they continued to be very motivated during the quit attempt. They said that without enough motivation and willpower, it would not have been possible to quit smoking. ‘First of all, you have to be completely ready for it, you have to be open to it, you have to really want it fully and the motivation has to be there. And also that you can do it and that everyone can do it. Even if you’re a heavy smoker, everyone can do it’ (participant 14, successful quitter, low income). Participants constantly reminded themselves that they were no longer smokers and that they would never smoke again. ‘You’ve quit. You have to flip a switch, because if you don’t flip that switch yourself by saying: “I’ve quit or I absolutely want to quit,” well, it’s not going to work’ (participant 5, successful quitter, low income). The decision not to smoke again seemed a very important contributor to quit success and was reported by almost half of the successful quitters. The support from close family members such as spouse or children was an important factor for many participants to stay motivated during the quit attempt. Some participants said that their family members did not smoke and disapproved of smoking, which motivated them to quit and persevere in their attempt. ‘My kids really hate smoking. Nobody else around them smokes. So yeah, they think it’s dirty, they think it stinks, they think I smell of the smoke. Those are things that really helped keep me motivated to quit’ (participant 1, successful quitter, high income). Participants also reported mental support and positive affirmation from their families, who expressed happiness and pride for the participant’s success. Some participants mentioned that their spouse had simultaneously decided to quit smoking and that quitting together facilitated mutual support during cravings at home. ‘It was nice to quit together with someone else. That way, there’s two of you, both in the same boat — and both of you are nice and cranky (laughs). But it does help. It means you get that support from one another, even when you’re at home’ (participant 21, successful quitter, high income). Some of these participants believed that they would not have succeeded in their quit attempt if their spouse had not quit smoking as well. An additional important success factor was the strategies to cope with craving and methods to stay abstinent that participants had learnt during the smoking cessation training programme. Almost half of the subjects gave an example of a strategy they used at difficult moments, for example, the knowledge that craving only lasts a few minutes and that they should distract themselves at those moments. ‘Those are the moments you have to make a change by doing something else instead: going for a walk, maybe, or grabbing a cup of coffee. I got that tip from [name of trainer] actually, and it’s made things a lot easier’ (participant 13, smoker, moderate income). The strategies helped as practical advice on how to act in difficult situations and provided reassurance and gave participants the confidence that they would be able to cope with the situation. ‘It got me thinking. When I have a craving for a cigarette, for example, I think: oh, it’ll only be three min and then it will have passed. Well, that’s good. For me, that’s a reassuring thought: Okay, it will be over quickly. And then I can go back to doing whatever I’m doing’ (participant 12, smoker, low income). This study aimed to investigate what successful and unsuccessful quitters considered to have contributed to their quit success, by interviewing employees who had participated in a workplace smoking cessation training programme in which they could earn vouchers for quit success. In particular, whether incentives had motivated participants to quit smoking was assessed. The current study showed that a workplace-situated smoking cessation training programme is convenient for smokers because they do not have to spend extra time travelling to a different location, and the workplace is a familiar setting. In line with this result, in a previous study, participants named lack of time and inconvenience as reasons for not participating in a smoking cessation programme.10 It is also conceivable that participants are more likely to sign up for a smoking cessation programme when it is ‘brought to them’ via their work, instead of having to search for counselling options themselves. This way, smokers who would not actively search for smoking cessation counselling could be reached. The participants appreciated that the employer covered the cost of the training. Previous research has also found that covering the cost of smoking cessation therapy increases its use.24 Finally, the interviewed employees appreciated the employers’ initiative to offer a smoking cessation training programme, because it was seen as an expression of caring for the employees’ health. Employees viewed the training programme as an opportunity and considered it an appropriate addition to the current company health plan. This is an important result for employers, since they could be hesitant to offer a smoking cessation training if they think that it would mean intervening too much in employees’ personal health decisions.6 In order to maximise participation, it may therefore be important to think about how a smoking cessation training programme is framed and communicated.25 This was confirmed by a study in which participants said that employers should avoid being ‘pushy’ and should avoid activities that were ‘shoved down [their] throats’.6 The employers from the current study presented the training as an opportunity for employees who wanted to quit smoking, and enrolment was on a voluntary basis without imposed pressure. This has most likely contributed to the positive appraisal of the employer offering the smoking cessation programme by the interviewees. An important strength of this study is the use of a qualitative methodology that enabled us to assess in-depth the personal experiences of participants. Furthermore, this study had a high response and reached saturation on the main topics. A limitation of this methodology, however, is that the small number of participants may represent a particular selection of the general population and results may not be generalisable. For example, employees disapproving of a workplace smoking cessation group training programme probably did not subscribe. However, generalisability is not the purpose of qualitative research, and this approach provided the possibility to investigate successful and unsuccessful quitters’ views on the incentives and on success factors in the process of quitting smoking. Finally, incentives for quitting smoking may be a sensitive topic and could be prone to socially desirable answers. This study showed that according to participants, a workplace smoking cessation group training programme with incentives provided several facilitators that helped them quit smoking. As stated by the interviewees, the workplace environment was convenient and facilitated peer support. The training programme provided helpful strategies that participants could employ to resist craving. From the participants’ testimonies, it was also apparent that personal motivation to quit smoking and a mind set to never smoke again were important promoting factors for quit success. The vouchers were appreciated as an additional factor and were not the main reason to quit smoking according to the participants. The effect of vouchers on abstinence found in the RCT could be explained by a subconscious stimulating effect. The findings of this study are an important contribution to understanding which specific factors according to employees who participated in a workplace group smoking cessation training programme combined with incentives have influenced their quit success and can be used to improve existing smoking cessation interventions. More research is needed to explain the contradictory effect of incentives on quit success, which is found when opinions of successful and unsuccessful quitters are compared with actual quit rates. We would like to thank the study participants for their time and valuable input, as well as the companies who facilitated the smoking cessation training programme and the interviews. We are grateful for the help of our colleague from Maastricht University Lotte Bouma-De Haan, who arranged the interviews.
. A narrative review of intensive group tobacco treatment: clinical, research, and U.S. policy recommendations: Nicotine & Tobacco Research, 2018. nty162-nty162. OECD. What are equivalence scales? 2017 http://www.oecd.org/eco/growth/OECD-Note-EquivalenceScales.pdf (Accessed 15 Dec 2017). Contributors FAvdB and GEN conducted the interviews. LMED and FAvdB analysed the data. FAvdB drafted the manuscript. All authors contributed to the writing and revising of the final manuscript. Funding This work was supported by the Dutch Cancer Society (grant number: UM 2015-7943). Ethics approval The study protocol was approved by the Medical Research Ethics Committee of Atrium Medical Centre Heerlen (no. 16-N-13). Data sharing statement The anonymised data from the current study are available from the corresponding author on reasonable request.